This design was built in Ireland for an Irish client and designed specifically to fit into the rating band for class racing at his home club. It benefited from knowledge gained developing the Ker 55 "Aera". 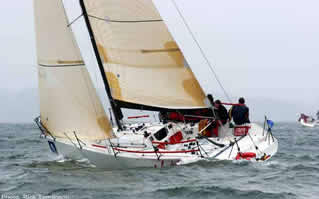 A sistership "Kimanche Eve" was built the following year and the two sisterships have collected heavy Trophy cabinets over the years, with the most impressive being perhaps the class win in the 2004 Rolex Commodores Cup and an Overall Win in the 2004 BMW Around Ireland Race.p> Later as "Kukukerchu" the yacht found considerable success on the Asian yachting circuit.